Happy NTT, friends! 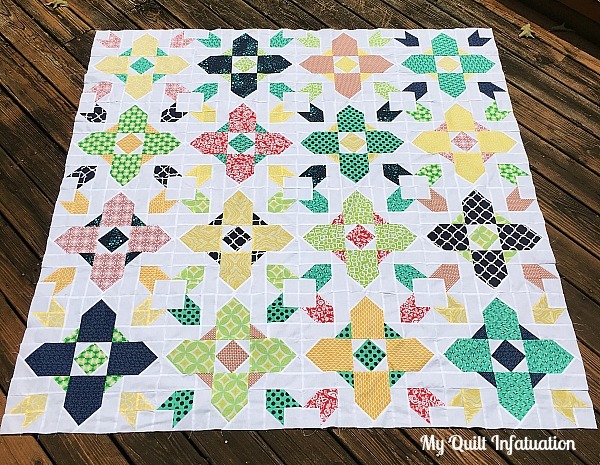 I finished up my Classic Meets Modern sampler quilt, and I am super excited to share it with you today. 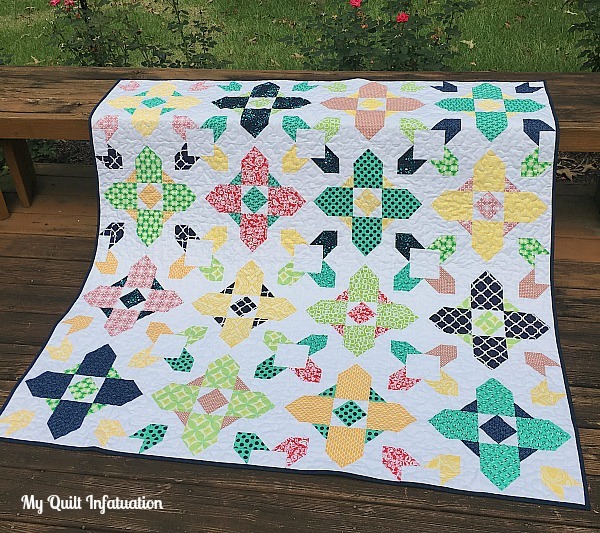 I had so much fun designing and making this quilt, though with so many things going on, I was a little stumped on quilting. 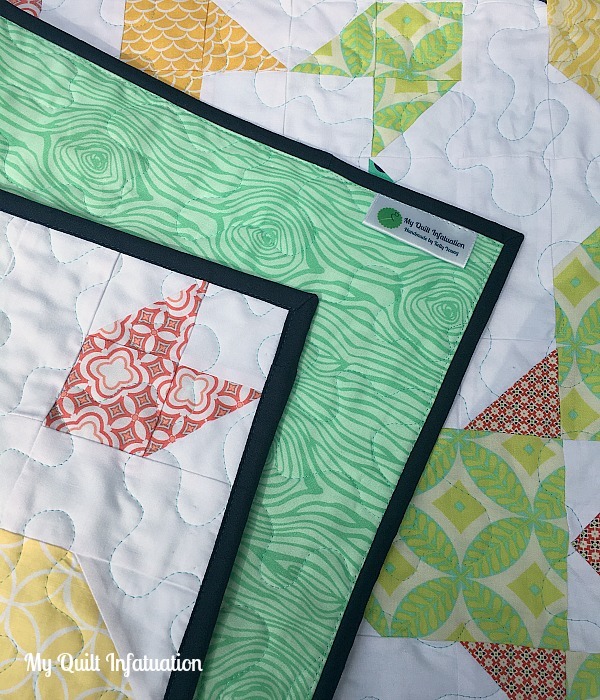 It would have been super cool to quilt each block differently, but I'm more of an "all over design" kind of girl. So, I decided on my favorite fall-back, a nice stipple with 50wt. 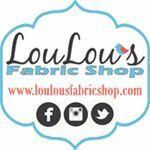 Aurifil White thread. It adds just enough texture to give it a good crinkle, and doesn't add to the busy design. 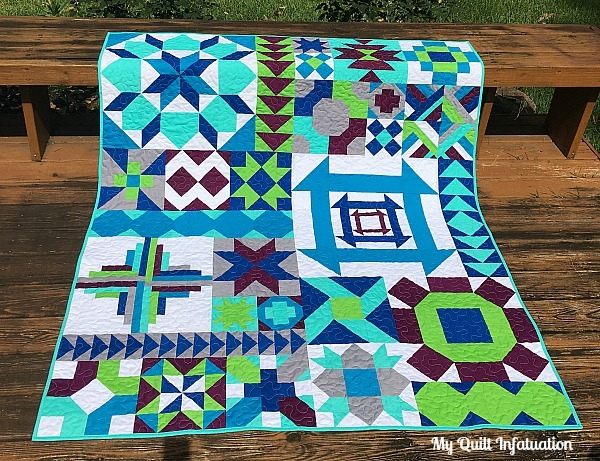 In case you're wondering, I used seven shades of Kona in this quilt- White, Steel, Pool, Turquoise, Royal, Berry, and Parrot. 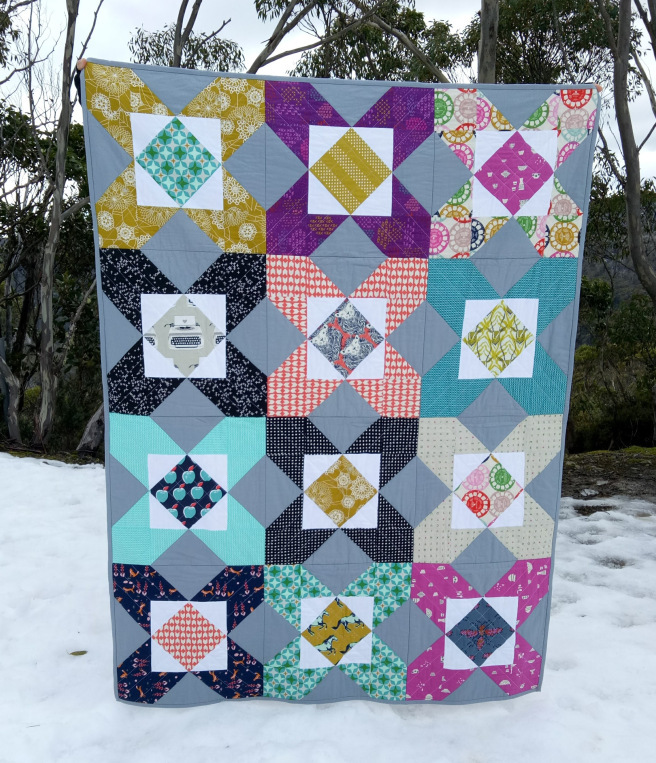 On the back, I had just enough of this awesome print for a nice center stripe, and the fabric looks like it was just made for this quilt, and I chose to border it with two stripes of the Parrot. The low volume print on the edges is by Cloud 9, and I really lucked out and found it on clearance. 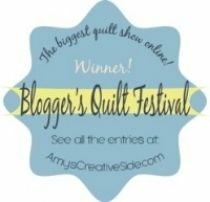 When it was time to bind the quilt, I really struggled with whether to give the quilt a frame with Berry, or have the binding disappear with Kona Pool. Ultimately, I wanted this quilt to be cool with a pops of warmth, and I decided I didn't want to add more warm color. I'm very happy with the choice. 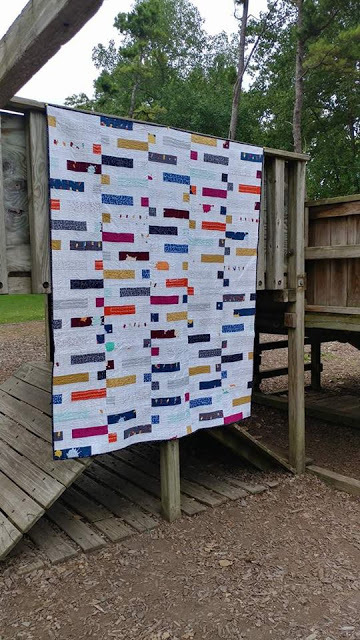 The response to this quilt becoming a quilt along in 2018 was overwhelmingly positive, but I still need to work a few things out before I decide for sure whether that will happen. I plan on making the decision with plenty of time to spare before the new year though, so stay tuned! 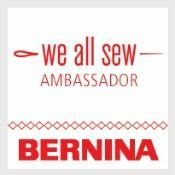 I can't wait to see what's happening in your sewing space this week. Let's party! I'm working on a quilt right now, and I can't wait to share it with you, but right now, let's party! 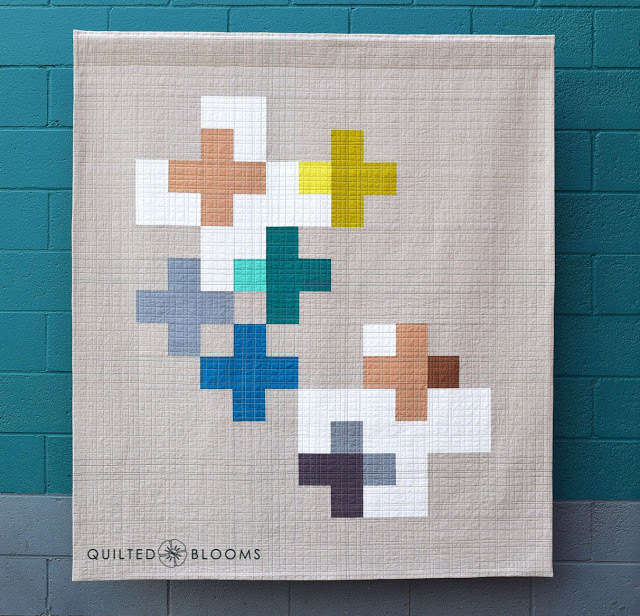 As the name of this post suggests, I've been working on a sampler quilt blending classic blocks with modern design. 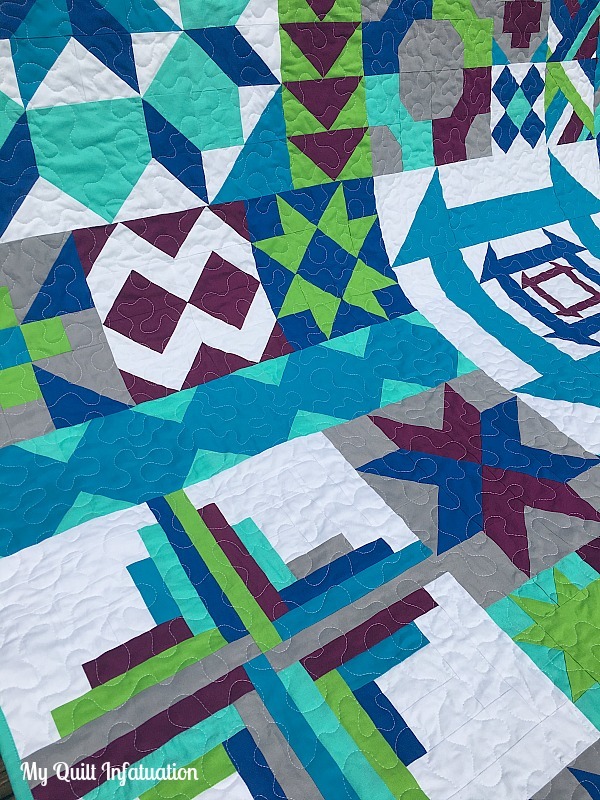 Each block in this quilt is actually a traditional block in the public domain, but the block sizing and layout, as well as the fact that the quilt is made in solids, really gives it a modern twist. 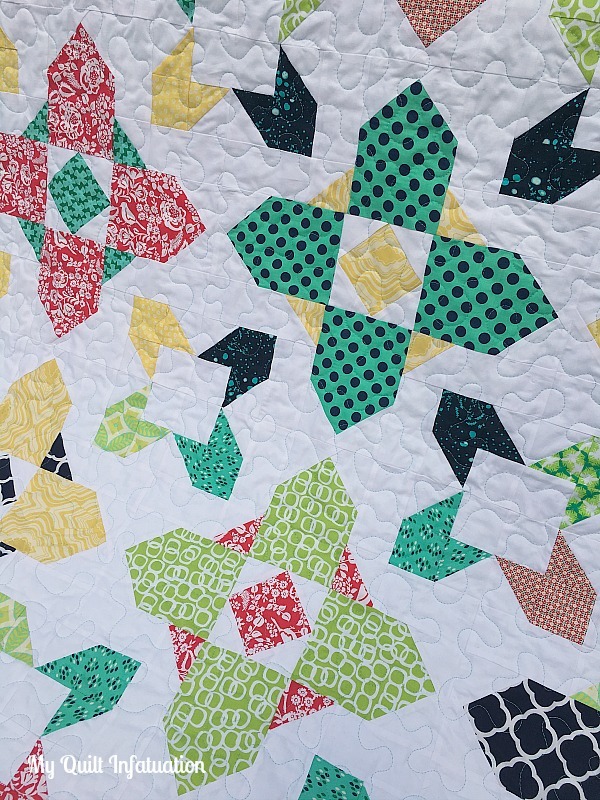 I don't work exclusively with solids very often, but they really give a graphic feel to the blocks in this quilt. I had a blast designing this top, and putting it together. 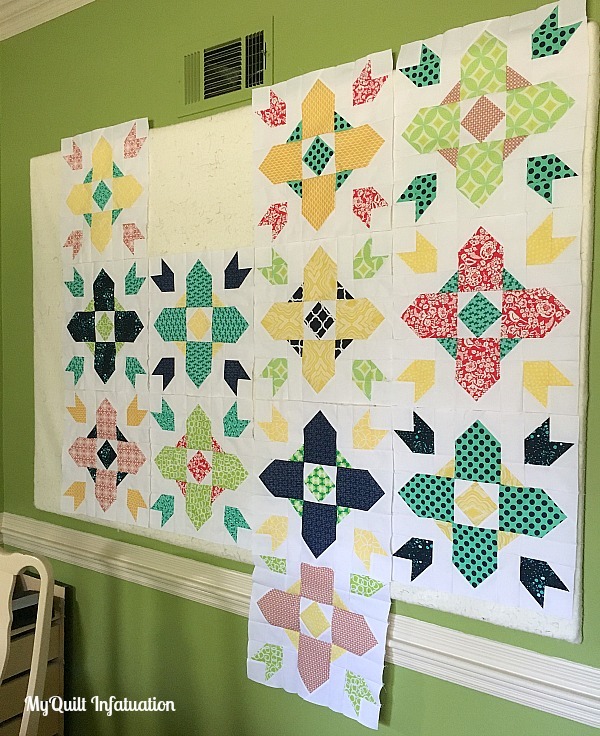 With so many different blocks and sizes, the entire process was so much fun! I'm working on finishing this one up and writing the pattern. 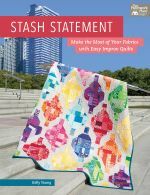 Right now, I'm considering hosting this as a Block of the Month QAL next year, but that is still something I'm mulling over. Happy Needle and Thread Thursday, y'all! This week has been a whirlwind, with the beginning of the week being dominated by the solar eclipse on Monday. My mom and grandmother drove up from Louisiana, and on Monday, we took a four-generation road trip to see the eclipse in all its glory. From the Memphis area, there were a few different driving options to get into the line of totality, but since Paducah is within just a few hours, there really was no question about where we would go. The workmanship and artistry on display in the National Quilt Museum are just stunning, but my favorite quilt by far was the Corona II: Solar Eclipse by Caryl Bryer Fallert. 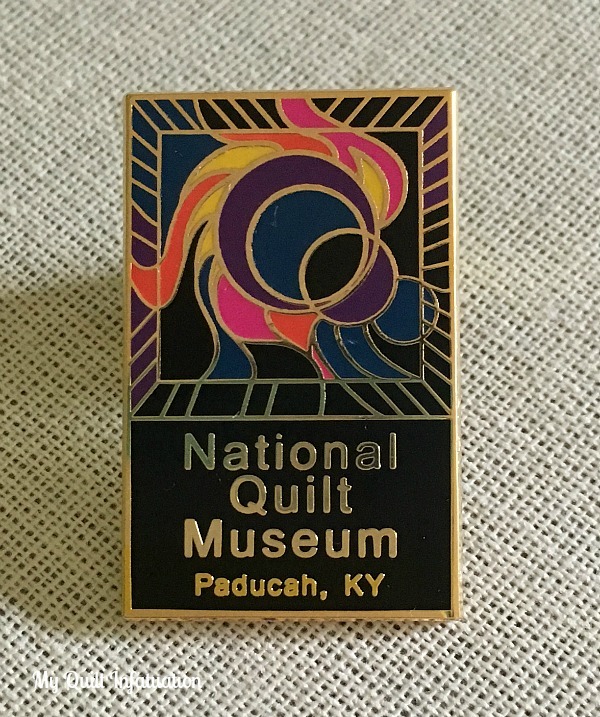 I purchased a lapel pin that depicts the quilt, but since I don't have permission to include a photo of the quilt itself (and photos are not allowed in the museum) you'll have to do a little online search for yourself to see how gorgeous it is- and even the photos don't do it justice. This was actually my first trip to Paducah, and I can't wait to go back when I can spend more time enjoying all the town has to offer. 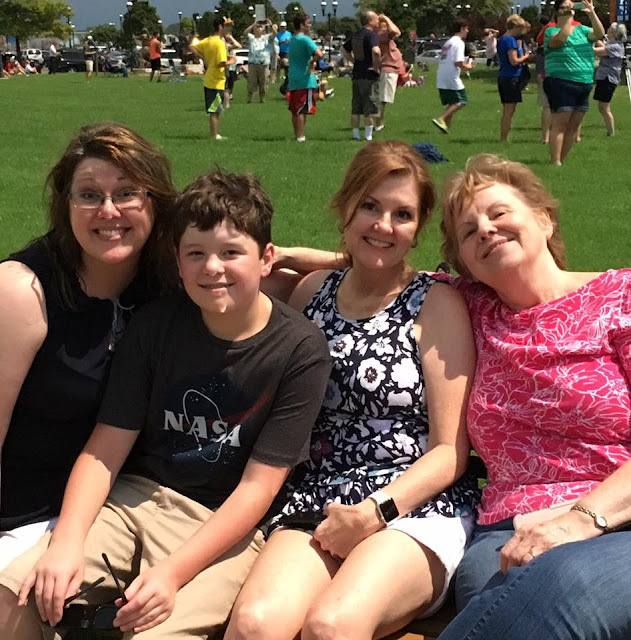 The weather was perfect for eclipse viewing, and since Paducah is not a major metropolis, we had zero traffic on the road, and it wasn't the sea of humanity that I was expecting. It was an unforgettable experience, though it did make for a tiring day. In fact, after cramming all of that into a single day, I feel like I'm still recovering. 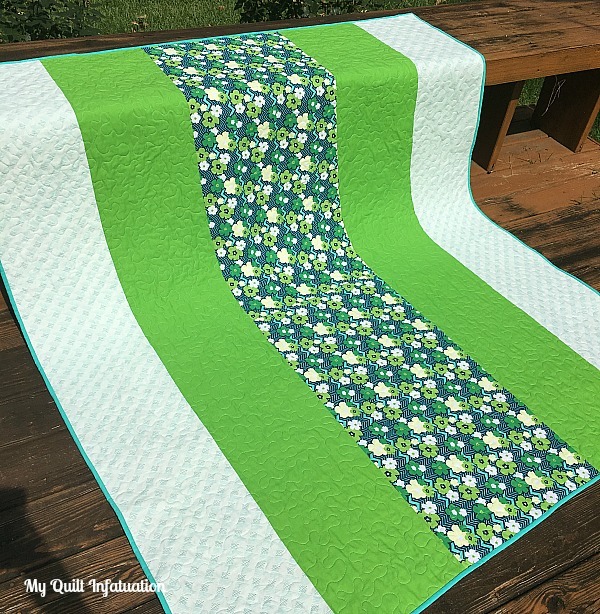 And this one called Racing Rails, by Little Bunny Quilts is so pretty! Happy Needle and Thread Thursday, friends! I'm delighted to share my latest quilt finish with you. It is a class sample of my Paper Doll Dress-Up pattern (available in my Craftsy and Etsy shops), and because the colors and fabrics remind me of airy summer dresses, I am calling this one Playing Dress Up. This is a color palette I've never used before, and I love how light and crisp it is against the Kona White background. Best of all, every single one of these prints came right out of my stash. I quilted this one with a gentle stipple with a soft, minty green thread. I think the softly colored thread adds just a little unexpected loveliness to the quilt. I used up all of my leftovers on the back, and paired it with this awesome mint green wood grain print, from Moda's Into the Woods collection. 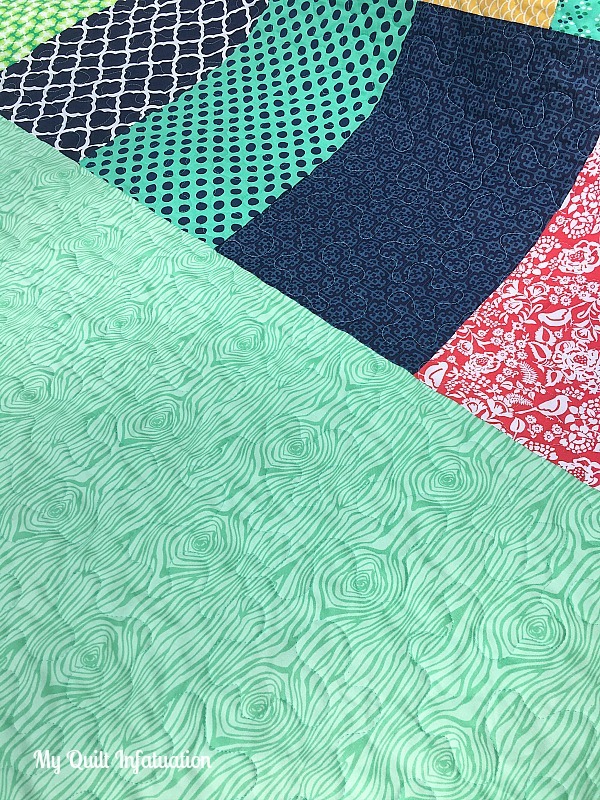 I've been eyeing this fabric in my local shop for awhile, and just hoping I could fit it into one of my quilts because I love it so much. Look how perfectly it blends! I had just enough Kona Navy in my stash to bind this one, and the dark binding creates a great frame for the quilt. Okay then! 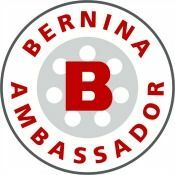 Time to check out some of the projects from last week's party that caught my eye! Like this Cotton and Steel beauty from Deb at New Creative State. 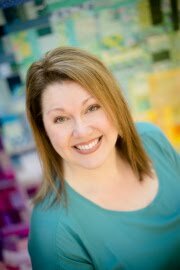 Welcome back to the party, Deb! 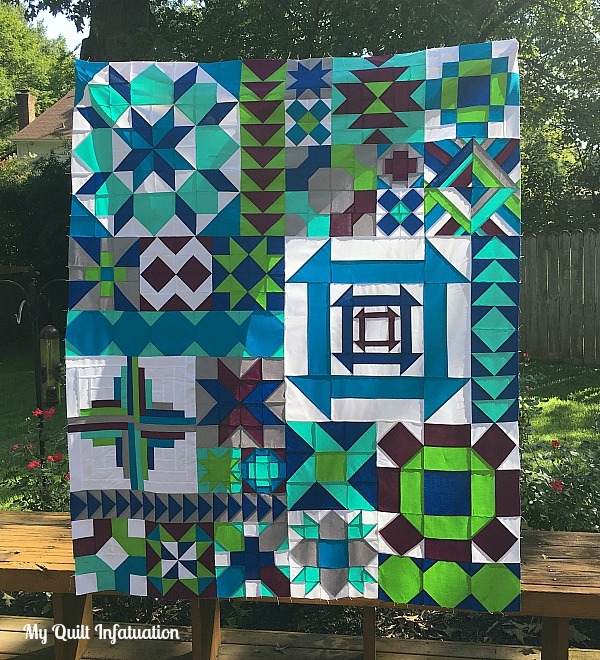 Next, check out this amazing quilt by Laura at Slice of Pi Quilts. Friends, at first I thought that pattern was printed on the fabric, but boy, was I wrong. Those little strips are all pieced! 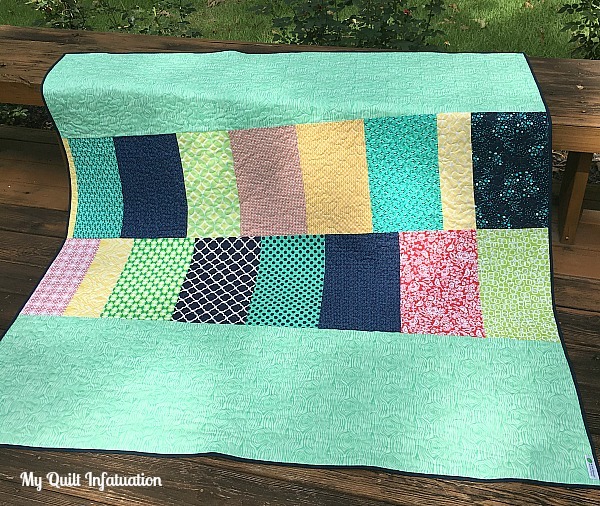 There are plenty of closeups, as well as a link to the tutorial for this quilt in her post, so go check it out. 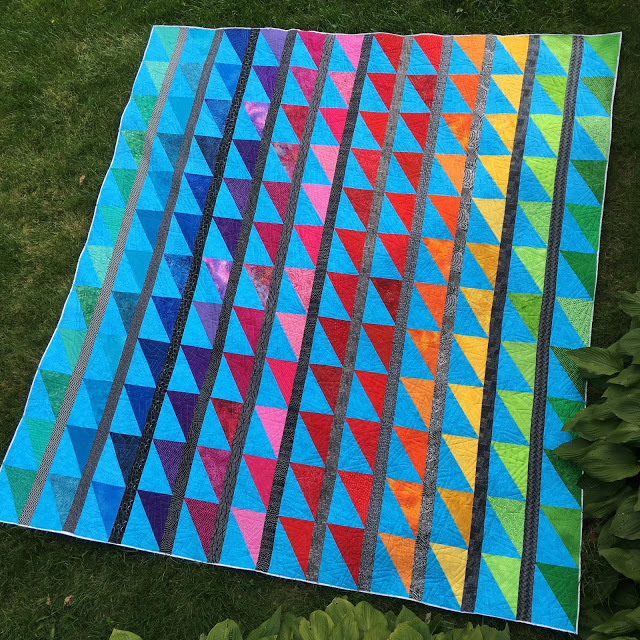 And finally, this improv quilt by Sophie at Luna Lovequilts is awesomely fun and modern! My goodness! So much inspiration. Y'all knock my socks off every single week. Time to show me what you've been working on this week! Whew! Well, we've made it through our first week of school, and I am one tired Momma. My wild thing is in 7th grade, so he is pretty much self sufficient in the mornings, but it is still a bit of an adjustment to trade the lazy days of summer for a regimented schedule. Certainly not a bad thing, but it just takes a little while to get back into the groove. It also means that I have more defined sewing time, which is great; and this week I put that time to great use by making a class sample of my Paper Doll Dress-Up pattern, the very first pattern I ever published. 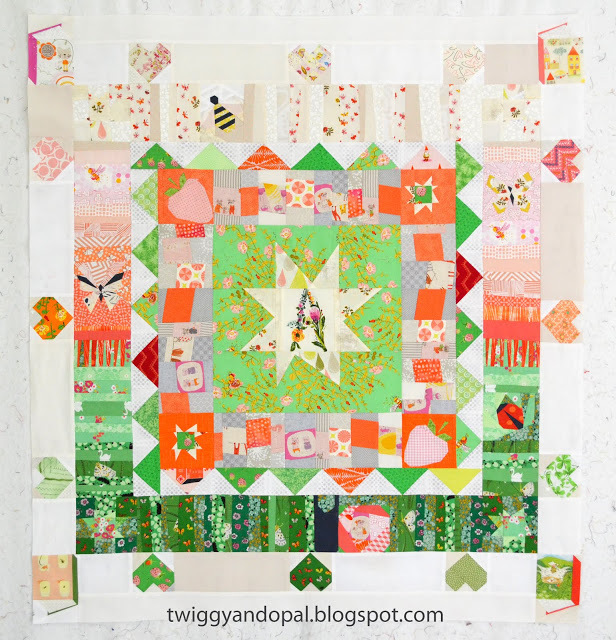 My original Paper Doll Dress-Up quilt was made with Bonnie and Camille's Scrumptious collection, and though I decided to make this one with fabrics directly from my stash, I tried to pull a palette that would have the same sweet and fresh feeling as the original. Of all of my patterns, this one has always held a special place in my heart. Besides the fact that it was my first, I really love the pretty cross shape with the halo around it, as well as the secondary curvy medallions that emerge when the blocks are put together. 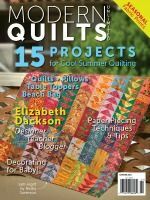 Best of all, these blocks are big, which means that the quilt goes together pretty quickly. 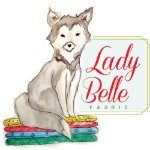 You can find my Paper Doll Dress-Up pattern in my Craftsy and Etsy shops. 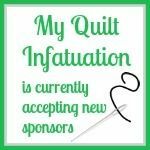 I already have this one basted and ready to quilt, and that's on my schedule for tomorrow, when a new week means I will have the house to myself once again. Sometimes (but not very often) when I'm working on a quilt, I make a single block at a time, from start to finish. I do this most often if I have other things to do, and I can only sneak in a few minutes of sewing time here and there. 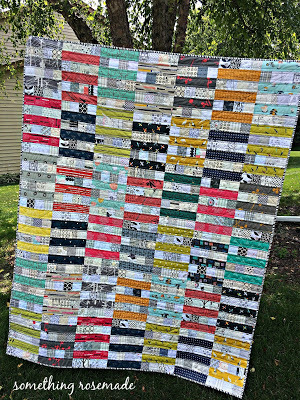 More often than not, since quilting is my full time job now, I prefer to do as much chain piecing as possible and streamline my trips to the ironing board. When that happens, I get all of the block units finished and pressed, and then it's almost like the blocks get finished all at once. Even though I'm making steady progress though, it doesn't really look like much for awhile. 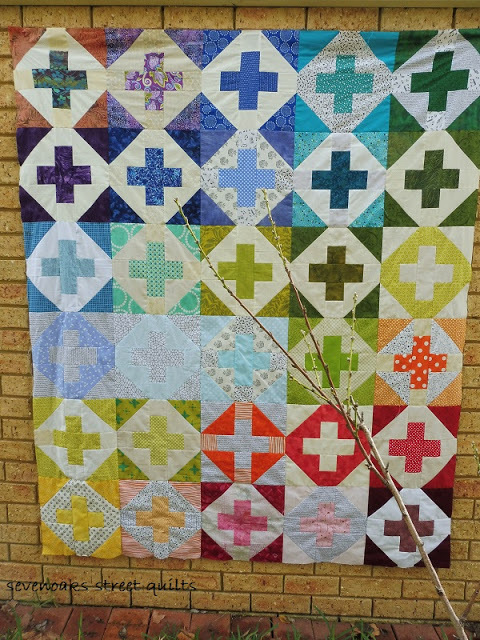 As it so happens, this quilt is one of those that has taken a little while to get to the stage of actually putting the blocks together. I'm actually SO close to having the whole top finished, but I decided to go ahead and snap a quick photo of my progress so we can get our party on. These colors aren't photographing very well inside, but they are really happy and fresh, and everything except the white came from my stash. I've been making a concerted effort to use up what I have, and I'm starting to see it pay off. I'm so very close to getting this one together, so be on the lookout for a prettier pic soon. 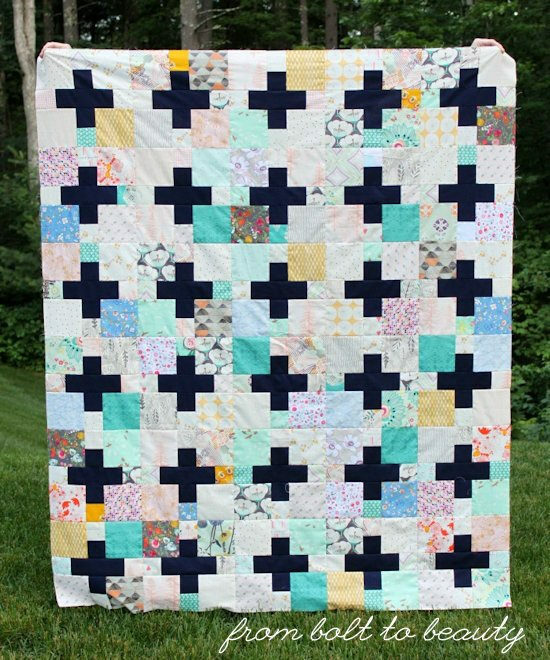 I just love the simplicity in this quilt by Something Rosemade. So fun and modern! 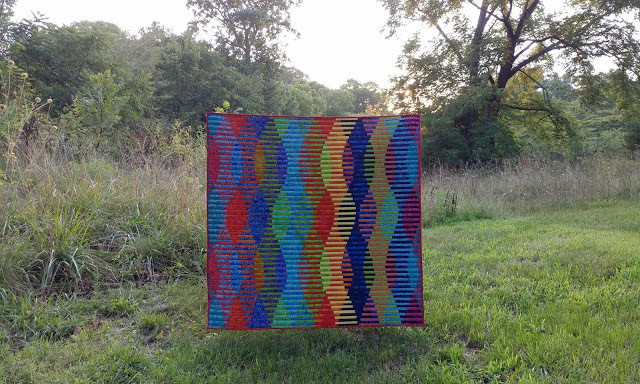 and just look at this stunner by Kathy at Kayak Quilting! Those little pops of red just make the quilt sing, and the photo setting is so picturesque. I know you're all ready to party, so let's do it!